Will the real Erdogan please stand up? From "Why are you running away, you sperm of Israel!" to "I am very sad to see that my country, myself, and my colleagues, sometimes, are labeled as being antisemitic." Last May an explosion at a mine in western Turkey killed 301 miners. Ankara declared national mourning. But President (then-Prime Minister) Recep Tayyip Erdogan's response to the town's grief was unusual for a head of a government. After protestors scolded him, he, with his bodyguards, went into a supermarket and, as video footage revealed, Erdogan grabbed one protestor, a Muslim, by the nape of the neck and yelled: "Why are you running away, you sperm of Israel!" 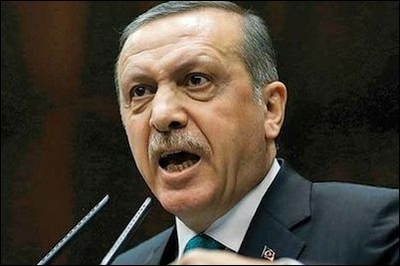 After the incident the man also told the press that he was slapped by Erdogan; then, thinking better of it, the man testified that he had been beaten by Erdogan's bodyguards, not by the prime minister; and he finally apologized to Erdogan for "forcing the prime minister to insult him." The man had been one of the protesters demanding an explanation for the negligence that caused the tragedy. Three months before the accidental explosion occurred, members of the opposition in parliament had claimed that there could be an accident due to bad safety procedures at the mine. Members of the government benches had claimed everything was fine. When Erdogan was in the US a few days ago, as Daniel Pipes of the Middle East Forum put it most realistically, the only content specifically designed for a New York audience was a protracted "I'm not an anti-Semite" defense: "I am very sad to see that my country, myself, and my colleagues, sometimes, are labeled as being antisemitic." Pipes wrote: "As he [Erdogan] spoke about being labeled an anti-Semite... I was glad to be in New York and not Istanbul." What would an American expatriate think, for instance, if a terrorist organization kidnaps three American teenagers, brutally murders them, then a senior member of the same terrorist organization publicly confesses to the crime, but the local authorities do not even raise a finger to indict the man? This is exactly what happened in Turkey, except that the victims were not American, but Israeli. Saleh al-Arouri, a veteran Hamas official and one of the founders of its military wing, the Izz ad-Din al-Qassam Brigades, was in 2010 forced to leave Israel after serving more than 15 years in prison. Since then he has lived in Istanbul – courtesy of the Turkish government. On Aug. 21, at a meeting of the International Union of Islamic Scholars in Istanbul, al-Arouri said that Hamas was behind the kidnapping of three Israeli teenagers in the West Bank, an incident that triggered a spiral of violence in Gaza and Israel this summer. It was the first time any senior Hamas figure linked the group to the abduction of Eyal Yifrach, 19, Gilad Shaar, 16 and Naftali Frenkel, 16: "The popular will was exercised throughout our occupied land, and culminated in the heroic operation by the Qassam Brigades in imprisoning the three settlers in Hebron," al-Arouri said. A couple of weeks after al-Arouri confessed to Hamas's crimes, and a few days before Erdogan, in New York, expressed his disappointment that he is "very sad to see that my country, myself, and my colleagues, sometimes, are labeled as being anti-Semitic," a Turkish Jew wrote a powerful blog post in the newspaper Radikal, about what it really meant "to be a sperm of Israel in Turkey." Vedat Haymi Behar is the digital marketing solutions coordinator at Turkey's biggest and most influential media outlet, Hurriyet group, which also owns Radikal. "Allow me to tell you what being a sperm of Israel in Turkey means," he wrote. It means, Behar said, to have first and family names in Hebrew or Spanish and to have a middle name in Turkish; and to learn at the age of three to be called by your first name only at home and by your middle name elsewhere. Being a sperm of Israel in Turkey means, Behar wrote, to gain the ability, at the age of primary school, to sensibly answer questions such as, "Why is your family name different?" It means, he wrote, to get used to living on hate speech, insults and curses every day. "It means having to choose a profession knowing that you will never become a judge, a prosecutor, a military officer or a bureaucrat…"
Behar lives in a country where President Erdogan, when he speaks to a New York audience, complains sorrowfully that sometimes "he, his country and his colleagues are being labeled as being anti-Semitic". But he also lives in a country where the same Erdogan had only a few months ago "insulted" a Turkish Muslim by calling him "a sperm of Israel." One of the two Erdogans must be a terrible liar. Burak Bekdil, based in Ankara, is a Turkish columnist for the Istanbul daily Hürriyet and a Fellow at the Middle East Forum.